My dear friend and blogging mentor the Nester is hosting a great party today featuring plants in the home. I LOVE my house plants and am so excited to participate. I confess that I’m a little lazy with house plants. I do great for awhile until I don’t. I need house plants that are a little self-sufficient. I need teenage house plants that want to be left alone. Unlike my sister, who has my mother’s thirty-something year old fig tree, I can’t handle that kind of pressure and responsibility. I’d get an ulcer trying to keep it alive. 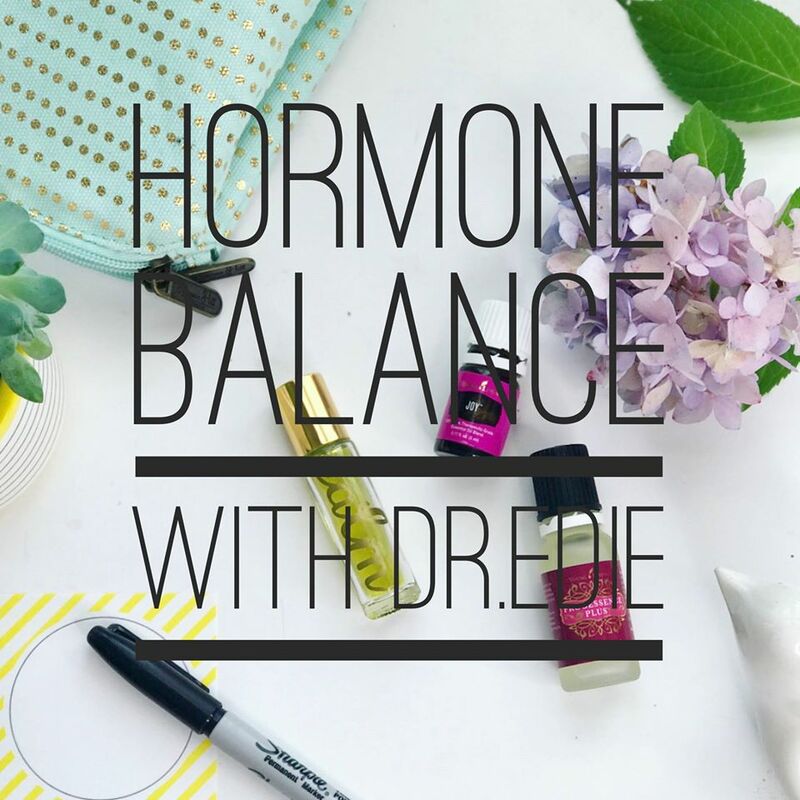 I need easy and simple but I love the life and joy they add to my home. My current favorite is the stag horn fern I bought in Nashville a couple months ago that sits right the middle of the living room. 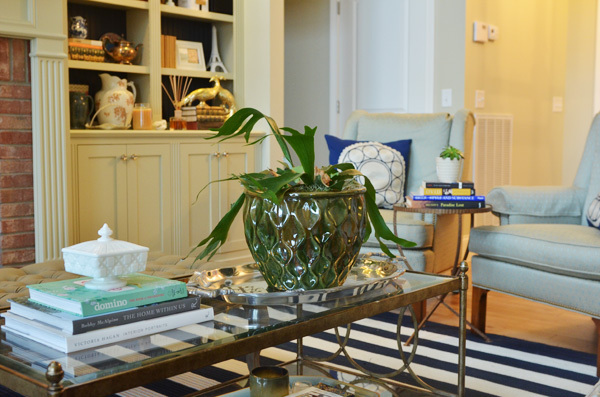 I LOVE this fern and it totally jives with my ‘Texas, cottage, Southern chic, eclectic’ vision for my home. I just added some really cool live moss that I found at our farm on Saturday. This fern is an attention getter and those brown parchment looking vestiges in the middle are part of the ferns’ charm provide some of the ‘food’ for it to grow and be healthy. This type of fern doesn’t even need soil but can grow on just a little moss. They can be hard to find but bring lots of enjoyment. Plus, who doesn’t want a fern named ‘staghorn’? I can’t think of anyone. I’ve had a long time fascination with aloe vera for obvious reasons. We live on the lake and little red cheeks and shoulders can’t always be avoided so I love having the cure right on the kitchen counter. I added some very cool looking lichen to the top, instead of my standard moss. It gives such interesting dimension and texture. My husband is crazy for lichen and he’s made a fan outta me too. 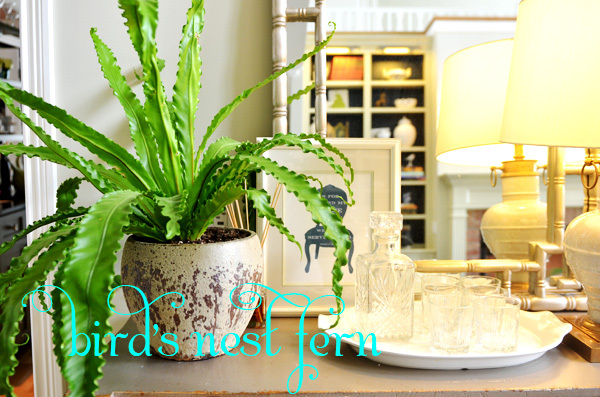 The bird’s nest fern is kinda cool and very low maintenance. It’s called bird’s nest because the inner portion, from where the fronds grow, looks like little eggs in a nest. 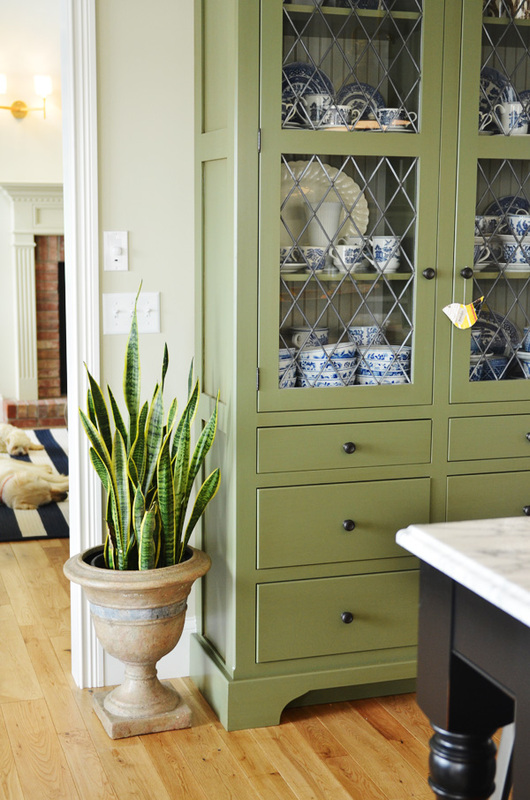 Then there’s the snake plant or mother-in-law’s tongue that’s hardy and easy to care for that for now sits in the kitchen. I haven’t even repotted this one yet because I want to paint the planter. It’s been doing fine for a few months just like that but I’ve got to do it soon so it’ll quit nagging at me. And I treat my plants just like furniture and accessories; they’re mine and don’t belong to a certain room. I can move them where I want so I take full liberty here and move them around as I see fit, taking into consideration light and temperature and such. Only 3 months after I had lived in this brand new house, I moved all the ottomans, chair and accessories from the living room to my bedroom. I LOVE it and am still working on tweaking it all. And luckily, they don’t care about light and moisture. These chairs were in my bedroom and that little succulent between them has been in the kitchen, my bedroom and the workroom. 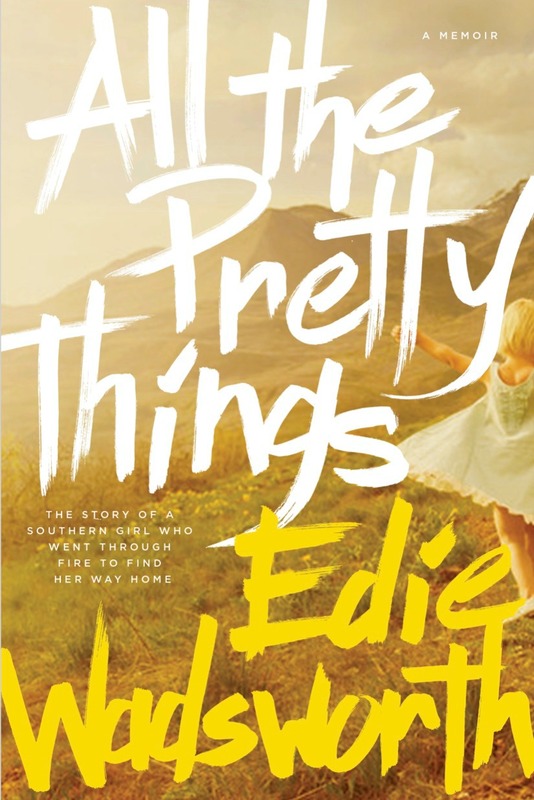 You might discover a whole new color palette or whole new way to think about life, just by moving things around. It’s my favorite decorating trick and gives you a whole new look without much time, effort or money. But I digress. Back to plants. The workroom is full of our green friends because there’s so much light that floods the room. And last but not least, my favorite category—-the succulents. They are a lazy houseplanter’s best friend. They don’t care if you go on vacation or on strike or temporarily insane. They’re like the cats of house plants. Too much attention, then you’re in trouble. They love you best when you leave them alone. I love their no nonsense attitude. And I’m always scouting out unique ones to try. These are ‘hen and chicks’ of the red and green variety. LOVE them. 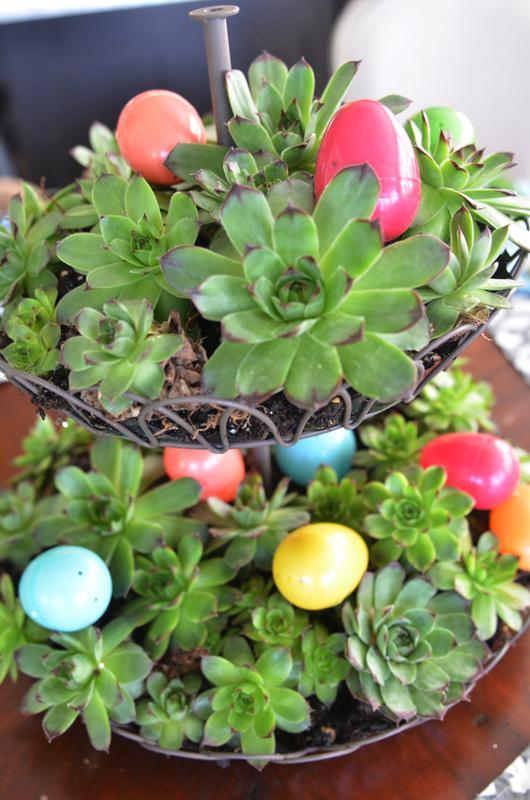 I even made a succulent centerpiece for Easter and am planning to plant the hen and chicks in my garden this week. And hope you enjoyed this house plant tour! I totally operate with a philosophy of grace with my plants. I don’t put myself under the law. If they die, I’m happy for the time we had together. They’re cheap and easy to replace. If they’re too high maintenance, then we agree to disagree and perhaps they’d do better living with someone else. They are good gifts from God but I’m not obligated to them like I’m obligated to my children. Life has enough pressures. House plants shouldn’t be one of them! What’s your favorite house plant? Tell me all about it and whether or not the likes of me can keep it alive! My succulent looks like an umbrella starting to fold up and the dirt is moist, so I think I must have loved it too much. I love your reference to “teenager” plants that want you to leave them alone! Looking at all your different and cool planters, I need to branch out a bit. By the way, after your December post on your giant Foo dogs, I found a couple small ones at Target- they were red but I spray painted them a deep turquoise. Thanks for all the inspiration! I should add (since my comment wasn’t long enough!) that I am a serial plant killer so I also own several good fakes. Nothing beats the real ones, though! Oh cool beans. I have it added to my “soon” list. Try Barbara Kingsolver too. What a cute post! I’m like you – I don’t get too attached. I change them out all the time – LOL. you’re talking about plants & i’m cracking up. i have a mr fern in my fireplace & some succulents in our family room. tada. end of story. that’s about all i can handle. i also love that loverboy has an opinion on lichen. he truly is a Renaissance man. he IS a renaissance man miss paige and it never ceases to amaze me! hank sends big slobbery smooches your way—i’m constantly evicting him from the sofa so that spot by Stevie’s feet is where he ends up. and why is he so smelly? i do not know. hope that brinkley is still doing well and recovering. My one must have indoor plant is an aloe vera plant. Anytime anyone has a blister or a sunburn(or a blister because of a nasty burn,) I reach for the aloe. Miss Edie~I love all your plants. So much variety. I have been wanting to add more plants in our home. We have a few but I would like more. I want to try some succulents, too. I saw the Letters of John and Abigail Adams peeking out from under your plant. I love that book. Have you watched the HBO special. It was very good. We took a wonderful field trip to Quincy. It is spectacular. I love aloe! So many uses. 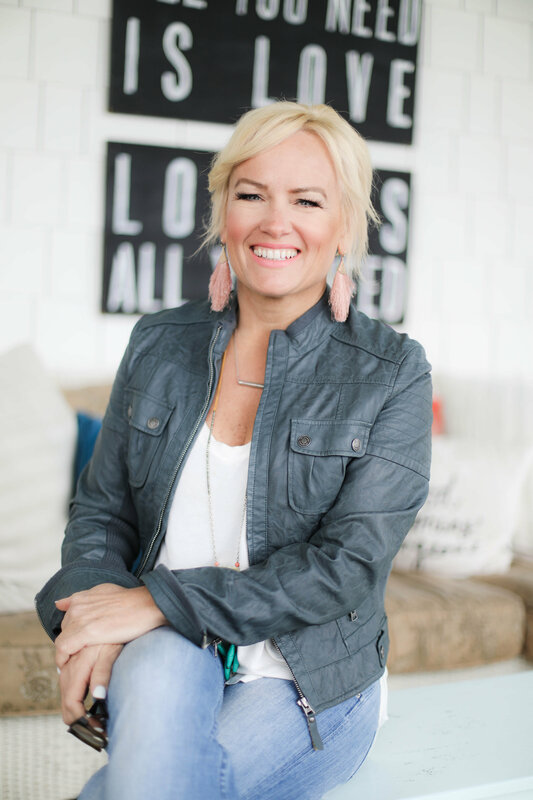 Every time I see your workroom it makes me swoon. My daughter and I sit here and try to look at it from every angle because we love every inch of it. BTW~she is in school for nursing like Caiti. I will mail out the pillow covers to you on Wednesday. Blessings!! Most plants eventually end up in my garage… where all plants go to die. It’s very sad. I’m hoping I’ll have better luck with my garden this year. oh yes, the dreaded garage. i’ve had many a plant die the same fate sasha! i seemed to have found a few that i can manage though, thank goodness. i sure do love them! HA!….”They don’t care if you go on vacation or on strike or temporarily insane.”…just my kind of plant and my kind of gal! Beautiful images as always-your home always makes me want to start rearranging the furniture but alas…I’m insane enough at the moment and my time would be better used maybe watering my plants! Cheers! i wish i could grow some indoor plants. maybe i’ll give the succulents a try. i typically end up killing all greenery within days of their arrival into the house. sad. that being said, i love herbs in the kitchen! after a few years of growing a happy rosemary plant, i recently tried a beautiful rosemary topiary. apparently that was too much for me as well. we left for vacation and i forgot all about it. it’s now a brownish ball on a stick, and i’m praying daily that some sun, aqua and tlc will bring ‘er back. we’ll see. i love herbs in the kitchen too deb but they don’t tend to live long in my kitchen. they either get snipped and thrown in the pot or die a worse fate! i can’t wait to plant my herb garden outside though!
? ?……the last photo looks like a cute, little double tiered basket ? I have one I would love to do a little succlulent thing with like you did…..GREAT idea !!! What is yours lined with ? COOL…..doing this over the weekend !!! Your post got me thinking I need more plants. I have some very big plants and yes one Ive moved around with me for the last 28 years! ( cut off and replanted and given away several ) My house now doesn’t seem to have alot of light or good spots to put plants. Last summer I think I knocked little pots into my sink 3 times due to the fact my windowsil isn’t quite wide enough! This week my goal was to buy some new smaller plants. At the grocery store I bought a baby tears plant and a nice looking African Violet, which I can never seem to keep growing good but will try again! I also found a darling pot I couldn’t live without. Last night I looked at Walmart and came home with 4 more smalls, an Ivy which if I don’t kill will get bigger I hope. Another violet, a little airy fern I put in the bathroom, and another rubbery type plant . I had so much fun replanting in some of my old pots I had , and am just so excited about them, they make me happy! So we shall see what happens. That being said, some of my older plants I’ve been trying and trying to get growing good, I think I will give up on and let them RIP….. I love plants, but don’t have any inside. It seems that every plant I’ve brought in, the cats seem to take a liking to! I am a fern lover! 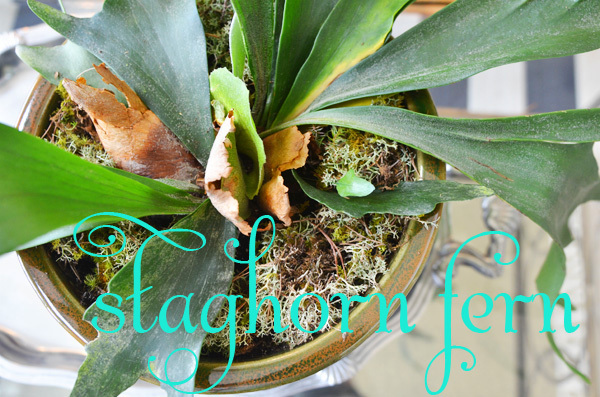 I have a staghorn that I bought at HomeDepot years ago – it was in a tiny pot and was just a few bucks. It is now HUGE and I’ve had comments from passersby that have never seen one as big! When someone told me that staghorns love banana peels, I found it hard to believe, so I Googled it and confirmed that they LOVE them for the potassium and are fed regularly. Just stick pieces of the peels in the nooks and crannies! Another favorite is a rabbit foot fern, whose rhizomes look just like the foot of a rabbit. It loves the shade (and the humidity we have here in the south!). I was able to separate mine last year by coring out the center, and now I have two large ones. Ferns. Love them! 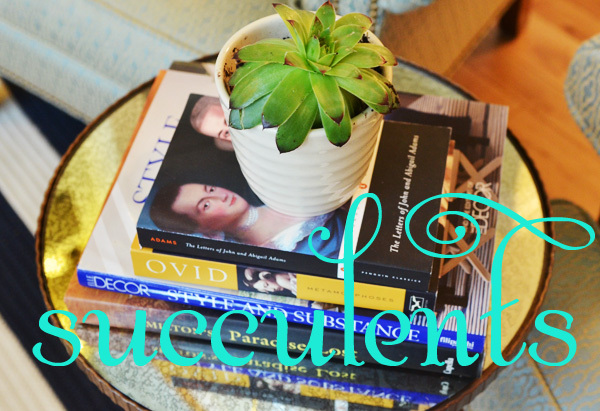 I can be pretty bad with plants – forgetting to water etc…but, even I can handle the good old succulents – I did a post about planting mine in tomato cans! I love your attitude toward plants!! 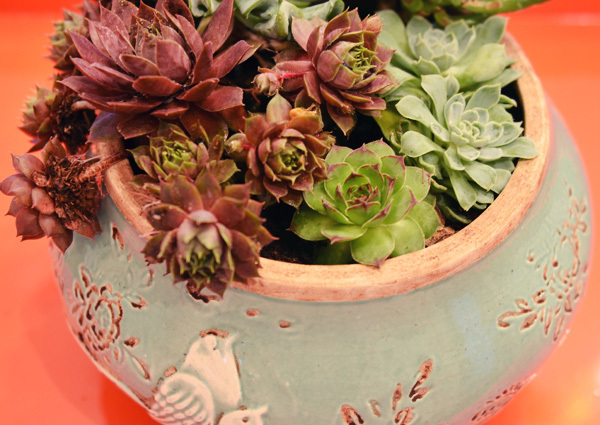 Succulents are fabulous…I miss having some around. Orchids are my favorite, but we haven’t gotten along well in recent years…maybe I’ll try again sometime when sweet newborns are not as much the priority around here! 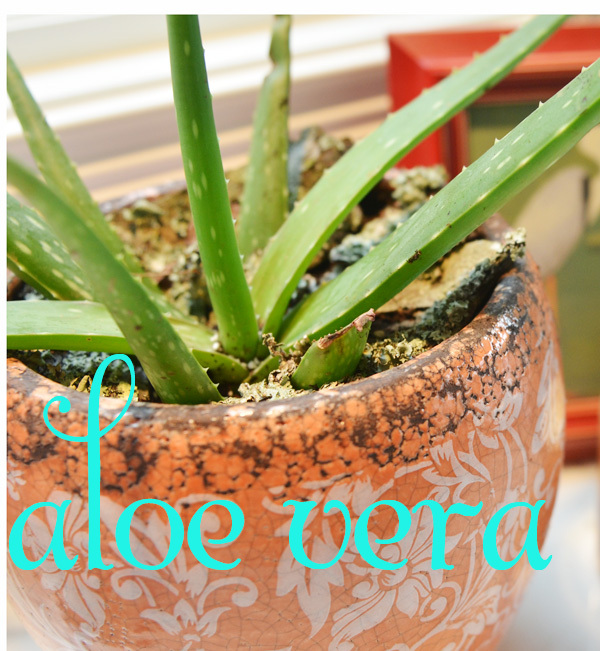 Love the aloe vera too — practical & beautiful!! halp, I left a comment here last week. I know it. and the week before. what is wrong with me, why don’t my comments show up. now I know this one will show up since I am now whining. I just bought a huge pot of hen and chicks. Now I have to figure out what I’m going to re-pot them in…Thanks for the inspiration! Informative post. You have managed & compile really a unique & real information. Its really very helpful for us. You’ve made some great points and it’s written really well. I found this quite educational! Great to put a name to some of these plants! 😀 I love your arrangement by the green cupboard – it’s a cute little nook! Decoration with plants is really great idea.You’ve made some great points and it’s written really well.It can be difficult to find good blogs nowadays. Keep it up. Oh girl, where did you get that coffee table? Mama love! BTW, loving your blog! Can you tell me where in Nashville you bought the Staghorn Fern? 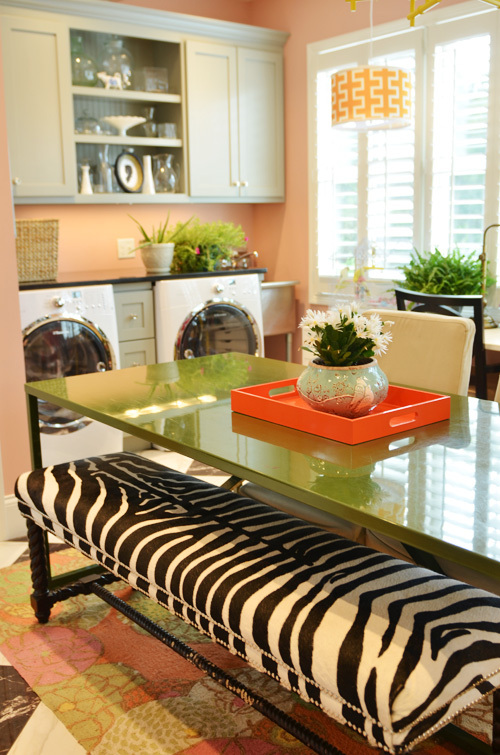 Can you tell me the name and brand of the color on your china cabinet, please! !